ISTiOSELIDA - Sailing ONLY: Team Korea Enters 34th America’s Cup! Team Korea Enters 34th America’s Cup! Team Korea will be known as the ‘White Tiger Challenge’. The White Tiger, or ‘Baekho’ in Korean, is one of the revered ancient guardian gods in Korean mythology, ferocious and potent, a fitting image for a team from one of the world’s major industrial nations with long term America’s Cup ambitions.Founder of Team Korea is Dong Young-Kim, an accomplished sailor and the organizer of one of the biggest prize money sailing events in the world, The Korea Match Cup. In launching Team Korea, he intends to boost public interest and knowledge of the America’s Cup and hopes to attract new people to take up sailing as their support for the team grows. The inaugural 2011/12 America’s Cup World Series begins this summer with three regattas to be staged in Portugal, UK and USA. 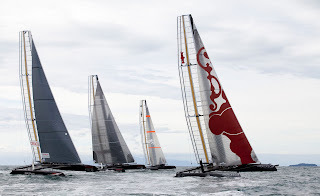 A further series is planned for 2012/13, before the Louis Vuitton Cup for all the Challengers in San Francisco in 2013, followed by the 34th America’s Cup match itself. Racing begins in new AC45 catamarans, which are then replaced by giant 72 foot wing sailed ‘monsters’, potentially capable of over 40 knots speed, competing in a combination of both fleet and match racing. “One of our major goals for the new America’s Cup is to enable teams to be sustainable sports franchises, so we’re excited to see Korea enter the America’s Cup for the first time, with sights set on building a team for the future,” Chairman of the America’s Cup Event Authority, Richard Worth said. Team Korea becomes the ninth Challenger accepted, together with two teams each from France and Italy, one each from China, Sweden, Australia, and New Zealand, plus the Defender from the USA. There are three additional challengers who have yet to announce and two more are in the process of having their challenges vetted, making a total of 15 teams set to compete in the 34th America’s Cup.